Let's hear what Micron management had to say. 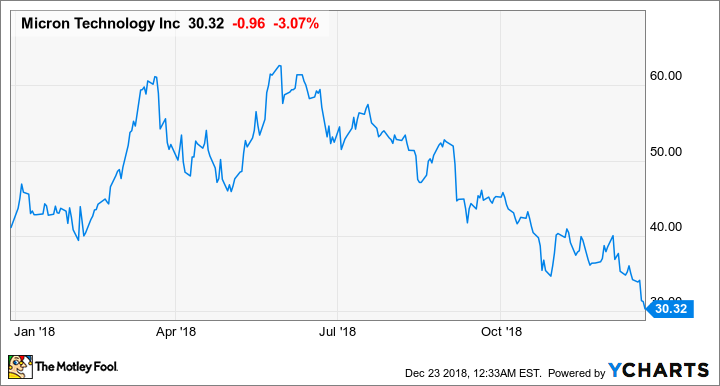 Memory specialist Micron (NASDAQ:MU) had a nasty surprise in store for investors when it reported its financial results for the first quarter of its fiscal 2019. The results weren't particularly problematic. In fact, they were about in line with what analysts were expecting. However, the company's financial guidance for the subsequent quarter was downright ugly, significantly missing what were already relatively muted analyst expectations. While the numbers tell us quite a bit, there's also plenty of insight to be gleaned from taking a closer look at what the company's management had to say on the accompanying earnings call. Here are three things from that call that investors shouldn't miss. Micron CEO Sanjay Mehrotra conceded during the call that while "we end calendar 2018 on the heels of unprecedented profitability for both Micron and the industry, we do believe we are entering a period of weaker market conditions." During his prepared remarks, Micron CFO David Zinsner explained that the company is "actively managing [operating expenses] by implementing expense controls across the company, including tighter controls on headcount, holiday work schedule slowdowns, and reductions in discretionary spending." Put simply, it appears Micron is going to try to extract more value from each dollar of operating expenses. While investors generally value efficiency, that efficiency is probably more valuable when business is contracting than when it's booming. Zinsner later clarified during the question-and-answer session that although the company is taking these steps to optimize its cost structure, it's "still making the necessary investments on the product side and the technology side." That's important, because technology investments tend to have long lead times. If Micron doesn't invest appropriately today, then several years down the road it could find itself with less competitive products to sell, which could hurt both its market share and its gross margin. Earlier this year, Micron announced a $10 billion share-repurchase program. During the call, Mehrotra told investors the company "began executing" on that program. During the company's most recent quarter, the company said it snapped up $1.8 billion worth of its own stock. That, the company said in its quarterly presentation, was good for "approximately 3.5% of shares outstanding." According to Zinsner, the company expects "to remain active with our stock buybacks in the fiscal second quarter, as we continue to make progress on our $10 billion repurchase program by returning at least 50% of our ongoing free cash flows to shareholders." While it's not good that Micron stock is down substantially year to date, as well as from when the company announced its repurchase program, the silver lining is that the company should, with the program currently in place, be able to buy up significantly more stock than it would've been able to when the share price was higher. Back on the company's Q4 2018 earnings call, Micron management indicated that a CPU shortage in the client computing space had a negative effect on the company's outlook for Q1 2019, the quarter Micron just reported on. At the time, Zinsner didn't quantify that impact. Chip giant Intel (NASDAQ:INTC) supplies the vast majority of CPUs for the PC market. And even though Intel raised its revenue outlook three times in 2018, going from guidance of $65 billion in sales to $71.2 billion, the processor giant's CFO and interim CEO told investors on Oct. 25 that "the lower end of PC and the [Internet of Things] business is being constrained" during the fourth quarter of 2018. Put another way, Intel won't be able to meet all the demand it expects to see for its low-end PC processors in the fourth quarter. Mehrotra told investors on the company's Dec. 18 earnings call that "we are continuing to see the impact of CPU shortages," although that was pretty much it from Micron management on that topic during the call. Micron investors might benefit from listening in to Intel's next earnings call, which should take place sometime in late January, to get a sense of when that CPU shortage is expected to subside.